A few years ago, North Coast Credit Union in Bellingham, Wash., started working with several of them in the area. Terry Belcoe, president/CEO of the $122 million cooperative, said the food offered to those in need was not the healthiest on the shelves and in the bins. 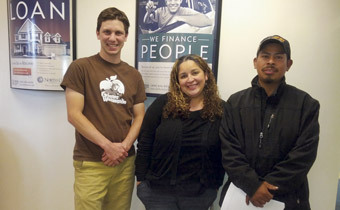 Santiago Lozano (right) with his approved operating line of credit secured by the Farmer Reserve Fund standing next to Grow Food’s Executive Director Ethan Schaffer and North Coast Credit Union Loan Officer Carolina Chavez. It all started with visits to the local food banks.